I read Battle Hymn of the Tiger Mother several years ago. I loved it. I was so interested to see how Chinese parenting differed from American parenting. I viewed it strictly as a memoir, not as a parenting manual, but nonetheless, I found myself agreeing with a great deal of it. So when Pamela Druckerman's book came out about French parenting, instead of rolling my eyes like so many and complaining, "Why do we have to read about another country's superior parenting," I couldn't wait to get my hands on it. And just like Battle Hymn of the Tiger Mother, I found it absolutely fascinating. I've decided if you're going to read books with parenting as a theme, this is the way to do it: part memoir, part parenting how-to. (For the record, I would say Battle Hymn of the Tiger Mother was almost all memoir whereas Bringing Up Bébé is about half and half.) Of course, I will still always love my nerdy parenting manuals (The Parenting Breakthrough, Love and Logic Magic, etc. ), but it is so fun to read an account of someone else's life and the discoveries about parenting they made along the way. Which is exactly what happens in Bringing Up Bébé. Pamela Druckerman is American. Her husband is British. And they live in France. After their first child, a daughter they call "Bean," is born, Pamela begins to notice some blatant differences between French children and her own child. For example, French babies "do their nights" (aka, begin sleeping through the night) somewhere between three and six months (and many much earlier than that), whereas Bean is not even close to sleeping through the entire night when she hits the six-month mark. She also notices other trends: French children sit quietly at mealtime, eat a wide variety of foods, and don't throw tantrums when they're told to be patient and wait. Now if you're like me, reading that last paragraph maybe fired up a little healthy indignation: "Well, my child slept through the night at six weeks!" (confession: mine didn't, but I know plenty of American babies who do). Or, "My nephew prefers lettuce over pizza" (true story). "He is a very well-rounded eater." Or, "You should see this mom in my neighborhood. Her kids obey faster than soldiers in the army." And so I had to remind myself (many times) that for the sake of making a believable argument, Druckerman had to make generalizations on both sides (and she's quick to acknowledge that in all cases they are that: generalizations). Of course just because you're an American parent doesn't mean you have to make your child the center of the universe. And just because you're a French parent doesn't mean you won't have a child who balks against the nation's standards. It's all in perspective. Depending on the research, you could probably make a case for the opposite side of the argument. 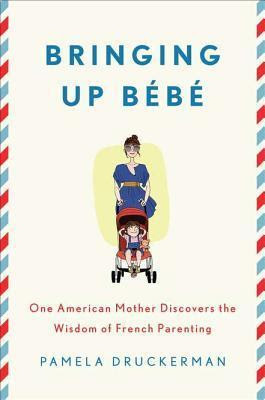 It doesn't change the fact that much of the research cited here in this book is still solid, reputable research (regardless of how it might be twisted to put French parenting in an extremely favorable light). Here's how I handled my own haughty moments of pride: if it was something I agreed with (insisting that children learn to play by themselves without adult intervention), I counted it as good research. If it was something I didn't agree with (children are just as happy, emotionally healthy, and smart being in daycare all day instead of at home), I reminded myself that this was just a memoir. Maybe not quite fair, but it worked. And I couldn't deny that some of her examples of American parents sounded eerily familiar. For example, when she described a mother in New York City who followed her child around at the park and narrated everything he did ("You're upside down! We came to the park! We came to the park! "), I felt certain she was describing the same mother I saw at the park last summer. The funny thing is that when I'm around mothers like that, I feel like I should be following my own children around, enthusiastically exclaiming over all of their activities. The reason I think it's funny is because if you held up two contrasting mothers (one who hovers and exclaims and another who sits quietly on the sidelines), I would definitely say that I wanted to be like the mom on the sidelines--present but giving my children space and freedom to explore. And yet, when I'm next to one of those overzealous mothers, I feel like we're in competition with each other and I have to prove that I'm just as attentive a mother as she is. According to Druckerman, French parents aren't like that, maybe almost to a fault in the other direction. One quote from early on in the book captured this difference perfectly: "American women typically demonstrate our commitment by worrying and by showing how much we're willing to sacrifice, even while pregnant; whereas Frenchwomen signal their commitment by projecting calm and flaunting the fact they haven't renounced pleasure" (p. 23). The book is organized like a parenting manual with each chapter focusing on a different aspect of parenting, and I felt that give-and-take (like I described above) with every single chapter. I agreed with parts; I disagreed with others; but even when I disagreed, it didn't lessen my enjoyment of the book because beneath it all was one person's fascinating and intriguing story. And I love the details of other people's ordinary lives. Last month, I mentioned that I was reading this book not just for pleasure but also because I felt like my own parenting could use a little pick-me-up. And it gave me just the boost I needed and empowered me to make some changes in our routines and my own expectations: one snack in the morning, one snack in the afternoon (Druckerman says the French only do an afternoon snack, but my kids wake up at 6:00am; they would never make it to lunch without a morning snack), requiring them to play downstairs in the playroom while I make dinner, making my instructions and requests more authoritative and convincing, not letting them interrupt Mike and me if we are having a conversation, and expecting Bradley to sleep through the night (never mind that at 16-months, he's well past the six-month deadline). So in this way, this book did exactly what I was hoping for. There were times though when I really questioned the credibility of the whole French way. For example, in the chapter, "The Perfect Mother Doesn't Exist," Druckerman talks about Inès de la Fressange, a French model and mother of two daughters. Druckerman says, "She says she's an imperfect mother, too," and then she quotes de la Fressange: "I forget about morning yoga, and I always put on lip gloss and mascara in the car mirror. What's important is to rid yourself of guilt over not being perfect." I think at this point I actually laughed out loud. I wonder what de la Fressange would think if she knew that sometimes I don't even wear lip gloss or mascara, period? There were other quotes like this one where I would think, "And this is who we're taking advice from? Really?" There were also times when I didn't really appreciate Druckerman either. She was sometimes a little crude for my taste, and I think our personalities are probably very different. Let's just say I was not surprised when she said that her first book was a "journalistic study of how different cultures treat infidelity" and was called Lust in Translation. I listened to the audio version of this book, and I honestly don't think there is a better way to read it. It just begs to be read aloud. I thought Abby Craden did a masterful job with the multitude of accents. Druckerman frequently described the quality of a certain person's voice, and Craden interpreted each one beautifully. I think I'd be lucky to pull off one convincing French accent, and Craden probably did over a dozen different variations besides various American, British, and other European accents. Really, really impressive. Plus, I always tend to enjoy a book like this more if I can actually here what "crèche" or "goûter" is supposed to sound like instead of just brushing over it in my mind. There's more I'd like to talk about (if you can't already tell, this would make an excellent choice for a book club discussion), but I think that's probably enough for today. I'm curious which country's parenting philosophy we'll see next? Ukranian? Ethiopian? Brazilian? No matter what, you can be sure I'll read it. This book, like "Tiger Mother," I've been tempted to read...but in my case...I can't undo anything I've already done! I have this one. I like it. It's smart. You have me curious about the audio. My husband and I read an article about this book some months ago, and decided that we really appreciated many aspects of French parenting. Thanks for a lovely review that put this book back on my radar - I'm eager now to find a copy and read the whole thing! I also commend you for being self-reflective enough to recognize when you considered something good research and when you thought of it as just part of the memoir. I'm not always so open about my biases, and I think that sort of analysis about your own response to a book is really useful. Thanks, Samantha. That's a very nice compliment although I think you give me too much credit! This is really interesting, and I'm not a parent yet. I do think there are huge cultural differences in how Americans raise their children. I may have to pick this up once I have kids (since it just doesn't fit my frame of reference right now). I agree--reading about what it's like to live in France was fascinating! We live in Belgium, so I guess parenting here is similar to the French way, but I'm Polish and my husband is Irish and I grew up all over the world, so my views are mixed, I think. I'll read any book whose premise is that there's no perfect way to do it. We're all doing the best we can and going by what we believe. She definitely didn't act like the French way was perfect, but she did criticize Americans a little bit (even though she herself is American). Wow! What a great mix of cultures you have at your house. That's awesome!